My mother, who taught me to quilt, is still piecing a few quilts at age 88. 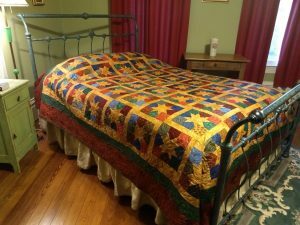 My brother wanted a new quilt for his bed, so she pieced it and I quilted and bound it for her. We presented it to him on Thanksgiving Day at his home where we always celebrate Thanksgiving. I’m very busy with T-shirt quilts for Christmas, but I wanted to take the time to share this photo.